I am feeling very Scottish this week. It’s hard to define what that actually means, but I am. I spent a lot of time online last week reading news stories about Scotland, and maybe that has something to do with it. The stuff about Matthew Wright got me all radged up – to the point where I did an uncharacteristically ranty blog post about it. Then a couple of days later I ended up howling with laughter at all the coverage of Hurricane Bawbag; taking screen grabs of the Wikipedia entry which was being edited by wee japing Jocks every couple of minutes. * At the end of that day, I kid you not, I had to crack open a can of Irn Bru. If I couldn’t actually be in Scotland, I could at least drink like I was. Perhaps it’s a nostalgia thing. Christmas in Edinburgh was one of my favourite times of year. I loved the German Market, the skating rink in Princes St Gardens, the carol service in the McEwan Hall… even the tacky oversized tinsel around the pillars outside the Dome on George Street. I’m missing that festive buzz of the city quite a bit. I got a phone call yesterday from a very worried sounding man at the tree nursery in the next village. ‘Can I just confirm your address for delivering the Christmas tree?’ he said. ‘It’s just that we only cover Oxfordshire and Hertfordshire…’ Apparently I had entered our old Edinburgh address into the online form, and he wasn’t confident that his wee white van was going to make it that far. But – whisper it – I like it here. I really do. Even though I’ve had to tone down my very-Scottish habit of using swear words as punctuation. Even though my neighbours still put their heads down and scurry off when I greet them with that most Northern of sayings; ‘Y’alright?’ And even though I still get strange looks from the local shopkeepers when I say ‘Cheers’ instead of thank you. This is a nice place. I’ve met a couple of lovely mums that I can easily imagine hanging out and drinking wine with. Our new house may not have the character of our old one, but when I was reading all the stories about Hurricane Bawbag, I was awfully glad to be in a warm and well-insulated flat for the first time in ten years. And now that I’ve finally worked out where all the best food shops are – online and on the high street – I can say with a large smile that the milk here is creamier, the apples are crunchier, and the egg yolks more yellow. This week, I get to enjoy all those good things about living in the South, but I also get to indulge my love of all-things-Alba by editing Scottish Roundup. I’ve got a genuine excuse to sit at my computer and check out the best of the Scottish blogosphere. What could be better? I might even crack open another one of those precious cans of Irn Bru while I write it. The holidays always bring a dose of homesickness… I’m glad you have the irn bru though, that’s not too hard to get hold of anywhere in Europe anymore, I must honestly say I’ve never had a sip of that iridescent, orange, fluid outside of Scotland, and the amounts I’ve had in Scotland have been very limited as well. Can you actually drink an entire can? 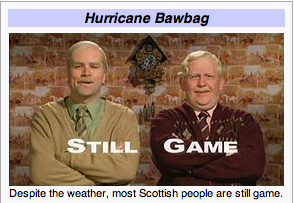 Hurricane Bawbag had me guffawing too! Only in Scotland, eh?! PS can u still get flat sausage where u are?